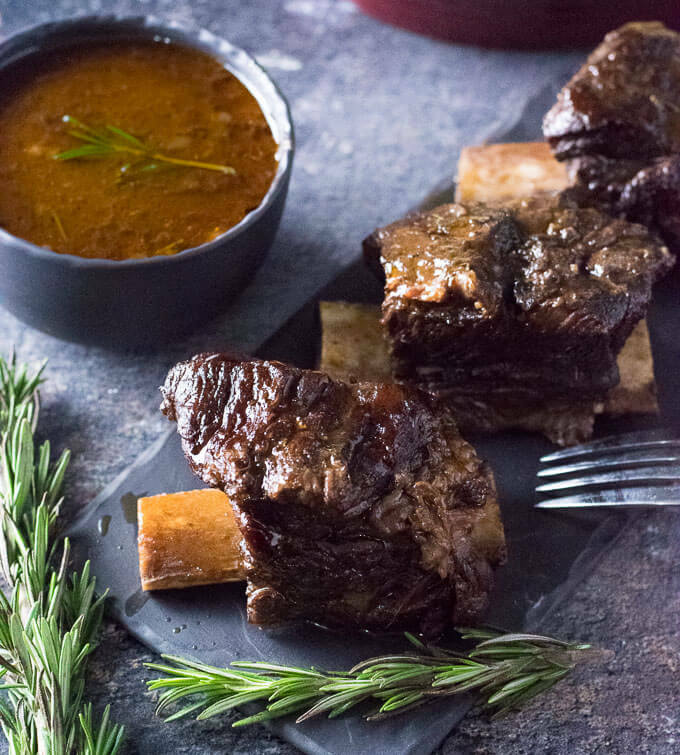 These ridiculously flavorful slow cooker beef short ribs are braised in red wine and slow cooked until tender perfection. The meal is effortless, but the rich flavors are incredible! I love the primal experience of eating short ribs. Tender hunks of beef clinging to a giant protruding bone, it is downright Flintstone-esque! However, as rudimentary as it may be, the flavor is as refined as anything that has ever come from your crock pot. Short ribs are a meaty cut of beef taken with portions of the rib bone still attached. Since this comes from the front of the cow, the meat is typically tough, requiring long cooking times to render it into an exceptionally tender meal. Short ribs can be purchased boneless as well, with the ribs removed. Occasionally it can be difficult to locate beef short ribs in a grocery store, particularly larger national chains. However, you can typically call your local butcher to have them specially cut for you. Alternatively, if you have Meijer supermarkets near you, they will also do custom cuts of beef at the customer’s request. 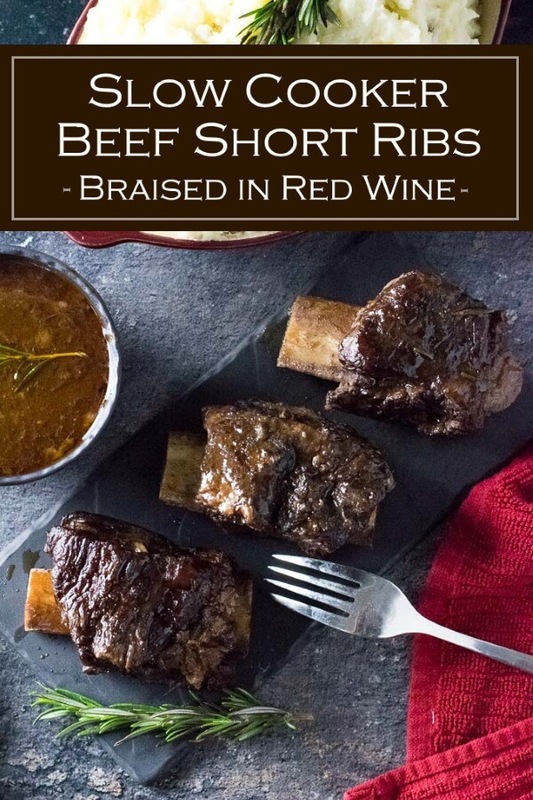 This slow cooker beef short ribs recipe uses red wine as the primary flavoring agent. 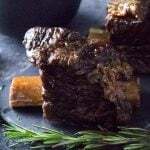 (If beer is more your style, check out my extremely popular beer braised short ribs recipe) Layers of flavor are created by first searing the short ribs in a skillet, and adding the unami flavor of tomato paste to the braising liquid with a touch of brown sugar added for sweetness. Fresh rosemary is the perfect complimenting flavor to pair with a red wine based sauce. Short ribs are a fatty cut of beef, so I recommend skimming off the pooling fat sitting on the surface of the braising liquid prior to serving. This will allow the flavors of the braising liquid to shine through more easily when it is ladled on your plate. 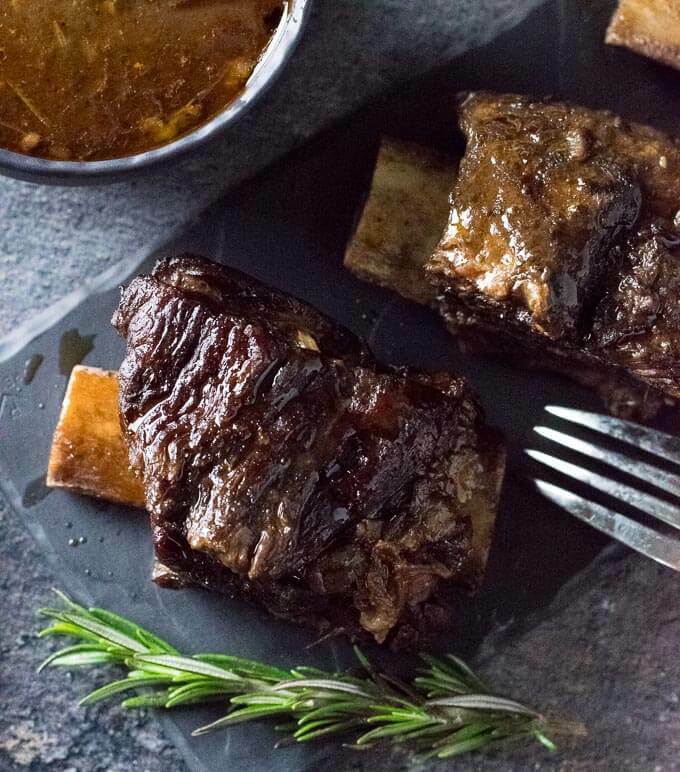 Slow cooker beef short ribs can be cooked on high or low heat in your crock pot (affiliate link). It will take about 4-5 hours on high heat, however, the real key is to simply keep cooking the ribs until they are tender. The longer you cook the more tender they will become. However, if they cook for too long, the meat will become too tender and fall apart. Properly cooked short ribs should still cling to the bone but easily separate from it when pulled. Heat cooking oil in a large skillet on medium high heat and brown short ribs on all sides. Place browned beef short ribs in the slow cooker, and saute chopped onions in the remaining oil. When onions are tender and browned add garlic and cook an addition 1-2 minutes. Scrape onions and garlic into slow cooker. Add 1/2 cup of beef broth to the skillet and whisk to remove burnt on bits from the bottom of the pan and pour the liquid into slow cooker. Combine flour, tomato paste, and brown sugar in a dish and add enough beef broth to turn it into a slurry and mix to combine. Then pour into the slow cooker. Add remaining beef broth, wine, rosemary, salt, and pepper to the slow cooker and set on high heat. Cook for 4-5 hours, or until short ribs are tender. Ladle off pooling fat on the surface of the slow cooker and discard. Serve short ribs with sauce from the slow cooker. *This recipe can be cooked on low as well, just plan on it taking a few extra hours. 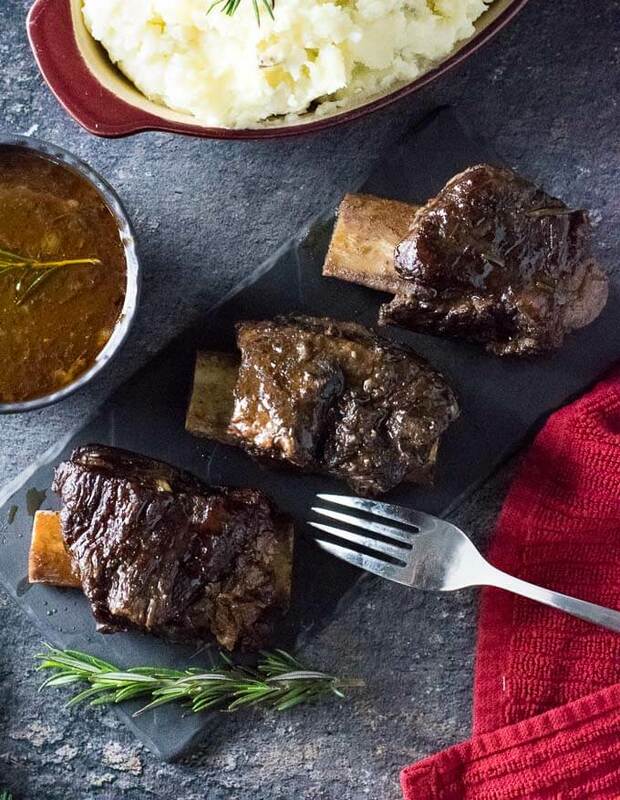 I recommend serving beef short ribs with my fluffy mashed potatoes recipe. They are phenomenal with the red wine sauce drizzled over! If you enjoyed reading my Slow Cooker Beef Short Ribs recipe then you should probably like me on Facebook and follow me on Pinterest too. That’s what I would do at least, because if you don’t get to know me but you still use my recipe it is kind of like taking candy from a stranger, and your mom taught you not to do that. Don’t disobey your mom, subscribe to Fox Valley Foodie today.